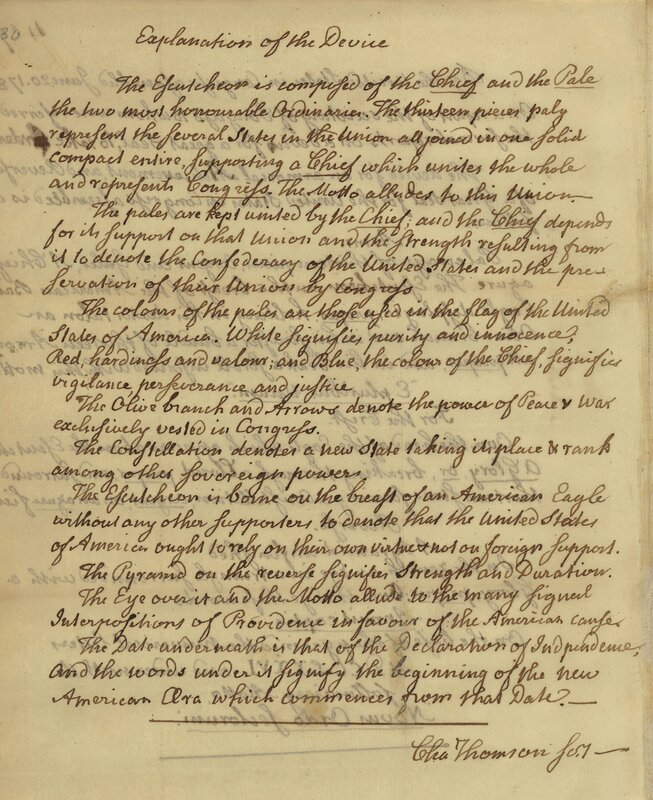 “The Date underneath is that of the Declaration of Independence, and the words under it signify the beginning of the new American Æra which commences from that Date”, wrote Charles Thomson in his report on the US Great Seal. He made the Seal final design, but never provided a translation, that is, he never wrote what the Latin was to mean exactly. ab integro sæclorum nascitur ordo. “The phrase is sometimes mistranslated as a New World Order, by people who believe in a conspiracy behind the design; however, it does directly translate to a New Order of the Ages”. “Much has been done both by Foreign and by British scholars to amend the Latin text, and to bring out more clearly the poet’s meaning in the many obscure phrases and sentences which occur in his writings”. Importantly, Virgil wrote for Augustus, who allowed the proscription and execution of Marcus Tullius Cicero. The Founding Fathers might have used Virgil to learn Latin, but would they have followed the author? Reasonable doubt only begins here. Charles Thomson was a Presbyterian. He would not — the same as many people, me included — regard a sibyl as an elder, an authority, or an executive agency. Sibylline rituals were pagan. They involved narcotics and burnt offerings. The women were uneducated, spoke instructed by their ancient ministers. Pär Fabian Lagerkvist gave the ancient prejudice quite an adequate description in his novel “Sibyl”. It is a story of a simple peasant girl taken to pronounce prophesies in a temple. She does not have mind as well as status enough to oppose the mythology. Education became available for girls hundreds or years after; legislation to let a woman run own business came later still. The ancient girl depended on the temple for food, clothing, and a roof over her head. Today, we would need a peculiar intellectual discipline, to hold age for unrelated to time. A phrase as a new order of ages naturally implies an altered temporal perspective, and we could not have Romanticism before Enlightenment, and Renaissance only after. It would be as trying to have the 19th century before the 18th, and the 16th century only after. There was a man of talent for persuasion, whose thought influenced the Framers. The man was Thomas Paine, and he titled his work Common Sense: unlike any altered view on time. Let us search the work for the Latin word æra. The “sæclorum” in the Eclogue has the digraph, but the “seclorum” in the Great Seal does not have it. Differences as here were arbitrary, but they were not trivial to the ancients; they marked a discontinuity, between the Classic and Roman Empire Latin. The distinction remained with Latin language scholars. The Eclogue probably was not the source for the Seal, and we need to work out the word sense on our own. Let us paraphrase the Common Sense usage for the English word order. Interestingly enough, if we wanted to render Thomas Paine’s phrase, “examples of ages” in classic Latin, the form would be aevi exempla, and not *seclorum exempla. The word shape order comes from the Latin ordo. We may compare Benjamin Franklin. “The family had lived in the same village, Ecton, perhaps from the time when the name of Franklin, that before was the name of an order of people was assumed by them as a surname when others took surnames all over the kingdom.” — Autobiography. Those times, second names often were assumed after the line of work or business. The Frankish word frank meant free, and the English Franklins were freeholders. Benjamin Franklin, Thomas Paine, and Charles Thomson went to grammar schools. Thomas Paine wrote he never learned Latin at school, but was able to familiarize with all the Latin content he needed. This means they all began their acquaintance with Latin in early years of life. Linguistics says that the early years are language acquisition years. Benjamin Franklin wrote, “My elder brothers were all put apprentices to different trades. I was put to the grammar-school at eight years of age, my father intending to devote me, as the tithe of his sons, to the service of the Church. My early readiness in learning to read (which must have been very early, as I do not remember when I could not read), and the opinion of all his friends, that I should certainly make a good scholar, encouraged him in this purpose of his”. — Autobiography. It is natural, in human language acquisition, to learn from usage. We can compare Cicero’s Second Phillippic, for ancient Latin. If we tried to picture what the Latin word ordo meant, we would think about a kind or body of people, persons within an organizing structure, or people of some recognition. Marcus Tullius Cicero was of considerable influence on the Founding Fathers. Wikipedia tells abut his legacy. Today, Latin is far more distant to the mind of the man in the street and most often we would want a citation, to interpret the language. However, when the language is modern, as English or Polish, we do not require for words to come from particular books. Resources continue to differ in presenting the Latin language, and the word shape seclorum is a good example on that. The Rudiments of Latin and English Grammar by Alexander Adam, of 1786, page 141, present the form seclor as a consequent of sequor. We can compare the Latin verb secludere, meaning “to stand apart”, “to become individual”. It had a participle, seclusus. For secludere, we can collate seclusus and seclum. The plural genitive of seclum is seclorum. In English also today, we have the phrase how come, to ask or tell how something has become. It shows a verb-participle-adjective interplay. “When in the Course of human Events, it becomes necessary for one People to dissolve the Political Bands which have connected them with another, and to assume among the Powers of the Earth, the separate and equal Station to which the Laws of Nature and of Nature’s God entitle them, a decent Respect to the Opinions of Mankind requires that they should declare the Causes which impel them to the Separation“, says the Declaration of Independence. The Latin seclum could be used to mean people who stood separate, differed with a regard, be it features, chronological age, or even decisions made at a given time. With the Latin ordo as a kind or body (of people), we can comprehend the Novus Ordo Seclorum as A New People (has be)Come, telling that a new country has become: some people have taken an independent stand for own government. 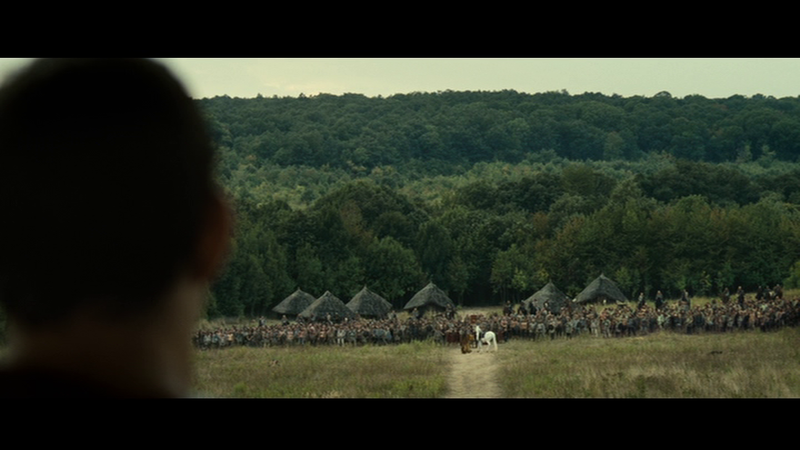 Ordo did not have to denote a linear arrangement, but it also could: moving through territories, Roman military happened to face local people, some in groups for welcome, some in battle formations, more or less as here, in the motion picture The Eagle. The people are not new to the Roman, they are Scottish. Paths have happened to diverge, for word sense and etymology. Today, we derive the words equal as well as adequate from the Latin aequus. In practice, adequate remuneration may not mean equal money, and equal money might be inadequate for jobs of different specifics. We derive the form of the word people from the Latin populus. However, the sense of Latin populus did not connote nationality or citizenship, in ancient times. The word often referred to laying waste or degrading. Perpopulor meant to devastate, pillage. Populabilis was close in meaning to destructible. The Senatus populusque Romanus remains associated with practices adverse to Christians. Ancient Romans did not have much sentiment for nationality. Their culture favored status, and that beyond people’s rights. The Roman civitas gave origin to the word civilian, but the sense was inseparable from the city of Rome. Well, and the city was not as much or often a republic, as a practice at pretending a liberal government. The word ordo had a dignified sense. The Latin law yet had words as aerarius and aerarium, for Roman residents who had to pay tax, but were not allowed to vote or hold offices. The regime conditions made business difficult, and gave no sense of national identity, to the people at large. Without legal rationale, Caesars were able effectively to give death verdicts among any people within the military range. To compare the Eclogue now, we might paraphrase the “ab integro sæclorum nascitur ordo” as “from one, a kind is born”, that is, out of one, many. The Seal does not follow Virgil. Charles Thomson proved that when there are no linguistic means ready, the human being is able to form new language uses. “The instance is without a precedent; the case never existed before, wrote Thomas Paine about America in 1776. The people who went to war then had not been all born in America, and some of those who had been, did not have a citizen or civilian status because of policies by George III. However, to reflect on nationality: place of birth does not in itself provide for any values in common, and all nations are in fact ordines seclorum, where various walks of life — secla — have a preferred recognition — ordo. Well, and sibyls, their time, were women with word play at hand. See the facsimile of the handwritten report. Bryce, A. Hamilton. 1894. The Works of Virgil, A Literal Translation. London: George Bell. Internet Archive. THE ARTICLE CAN BE USED UNDER ANY OF THE CREATIVE COMMONS LICENSES: ATTRIBUTION 2.5, BY-SA 3.0, OR 4.0. TERESA PELKA. Feel welcome to learn reading the Seal in classic Latin. THE LATIN DEMEANOR: PRONOUNCING THE SEAL LATIN.